Laminate flooring, first marketed in the early 1980s, has become a mainstay in American homes. It is extremely durable and looks remarkably like the wood, stone or tile that it mimics. Just as attractive are the pricing and the ease of installation. Laminate flooring costs under $1 to less than $4 a square foot and snaps together easily, making it a money-saving project for even less-experienced DIYers to tackle. What is laminate flooring and who makes it? First developed by a Swedish firm, Perstop, in 1977, laminate flooring was marketed in Europe under the Pergo name in the early 1980s. Since then, most flooring manufacturers, including DuPont, Armstrong, Wilsonart, Mohawk and Shaw, have produced their own brands. Laminate is not the same as manufactured-wood flooring, which is made from a core similar to plywood with a veneer of real wood on top. The basic composition of laminate flooring is simple: a photo of the material the flooring is being manufactured to look like is laminated onto a high-density fiberboard core and covered with a hard melamine coating. The bottom and edges are coated for water resistance. Because the surface is simply a photo, laminate-flooring manufacturers can easily imitate all kinds of flooring materials, including wood, stone and tile. In addition, higher-quality laminates are textured on the surface to recreate the dimensional look and texture of wood grain or the dimpled appearance of stone and tile. "Floating" floors now are the most common system for laminate flooring installation. In a floating floor, nothing is attached to the subfloor; the interlocking edges of the laminate are snapped together to make a tight connection, or sometimes the tongue-and-groove edges are glued. The whole unit floats atop the subfloor, free to expand and contract with temperature and humidity variations. Laminate flooring comes in thicknesses ranging from 8 millimeters to 12 millimeters--the thicker the flooring, the more expensive. 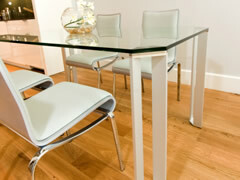 More expensive laminate is backed with underlayment that provides some or all of those functions. Aluminum oxide often is added to the flooring finish, which makes it extremely durable. Good laminate is very resistant to dents and gouges, though it still will scratch. When selecting laminate flooring, look for the abrasion coefficient (AC) rating, which measures the surface strength on a scale from one to five. A rating of five, the hardest, is usually reserved for commercial use. Three is considered standard for regular home use, while a rating of one is recommended only in very low-traffic areas. Many manufacturers will make moldings and trim in the same finish as the flooring; the matching materials look very good, but their cost can run as high as the flooring itself. Laminate flooring, while it does have some water resistance, should not be used in high-moisture areas - namely kitchens, bathrooms and laundry rooms. Water will cause the laminate core to swell and buckle. While the same is true of wood flooring, solid wood can be refinished if it is damaged. Laminate needs to be replaced. Many people object to the plastic sound when walking on laminate. The use of sound-damping underlayment helps, but does not eliminate the noise completely. The core of the flooring usually is made from scrap and recycled wood; however, laminate can emit small amounts of formaldehyde, volatile organic compound (VOC) that can cause respiratory problems. If you want to further investigate laminate flooring, fill out the easy form on this page. You can also visit your local big-box home improvement store and any specialty flooring stores to compare samples of various brands of laminate flooring.